I believe that LIFE OF PI is director Ang Lee's most technically accomplished emotionally arresting and finely balanced film. It surpasses even LUST, CAUTION. 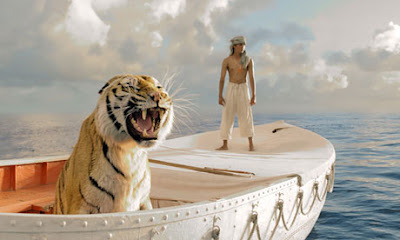 LIFE OF PI must also be one of the most beautifully rendered adaptations - and all the more surprising because the novel upon which it is based was widely regarded as "unfilmable". Ang Lee, using a screenplay by David Magee (FINDING NEVERLAND), has responded with a film that is both faithful to the content of the book, but also to its sense of wonder and its examination of the slipperiness of faith, identity and storytelling itself. All this might make the film sound rather dry and earnest, but it is anything but. Because at its core, this is a movie that asks us to fall in love with a young boy, admiring his resourcefulness and compassion. That boy is the eccentrically named Pi Patel, born in French India on the verge of independence. He embodies the loose infinite multiculturalism of India - creating his own patchwork faith of Hinduism, Catholicism and Islam - much to the chagrin of his liberal humanist father. The family travels with their zoo animals to America in search of a better life, but a storm hits, leaving Pi the only survivor about a life boat with a vicious Bengal Tiger. He is clever enough to be wary, to survive, thanks in no small part to his patchwork faith. And, in the movie's framing device, tells his story, or versions of it, to the French-Canadian writer who will choose which tale to tell. Irrfan Khan and Rafe Spall have an easy familiarity as the elder Pi and the writer. But the movie really belongs to Suraj Sharma who plays the teenage Pi who finds himself on the boat alone with the tiger, and holds our attention for over an hour. It is a performance that feels utterly natural and compelling and draws us into the story. We care passionately about how he will fare, just as we care about the tiger "Richard Parker" - and because of that, we follow him even as his tale becomes bizarre and magical. In the epilogue, the movie asks questions about the nature of storytelling and the value of faith. I might not agree with the answers it gives, and they have certainly caused some controversy. But one cannot deny that the movie finely balances spectacle and provocative ideas in the most charming package. This is clearly one of the films of the year, and the best of Ang Lee's career. It also shows what an imaginative director can do with the appropriate use of 3D and CGI rendering when his intention is to marry it to the material rather than shamelessly cash in on higher cinema ticket prices. LIFE OF PI was released in November in Canada, Puerto Rico, Taiwan, the USA, China, Hong Kong, Macedonia, India, Cambodia, Malaysia, Singapore, Indonesia, Pakistan and Spain. It is released on December 14th in Vietnam; and on December 19th in Belgium, France; on December 20th in Belarus, Bosnia, Czech Republic, Greece, Hungary, Ireland, Israel, Italy, Kazakhstan, Kuwait, the Netherlands, Portugal, Serbia, Slovenia, Thailand, the UK, the UAE; on December 21st in Brazil, Bulgaria, Colombia, Ecuador, Estonia, Finland, Iceland, Lithuania, Mexico, Sweden and Venezuela; on December 25th in Denmark and Norway; on December 26th in Austria and Germany; on December 27th in the Dominican Republic and Peru and on December 28th in Turkey. It is released on January 1st in Australia, Costa Rica, El Salvador, New Zealand, Nicaragua, Panama and Russia; on January 3rd in Bolivia and Chile; on January 4th in Guatemala, Honduras and Philippines; on January 10th in Argentina; on January 11th in Poland and on January 25th in Japan.